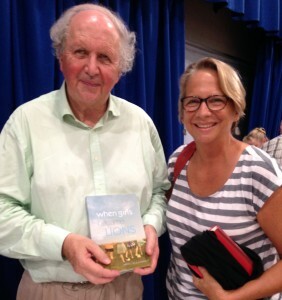 Alexander McCall Smith, the delightful & prolific novelist best known for his bestselling series “The No. 1 Ladies Detective Agency,” recently spoke at a literary event in Australia that Jo attended. After he signed one of his new books for Jo, she asked if she could give him WHEN GIRLS BECAME LIONS. Not only did he say, “Yes, Please!”, he asked her to sign it, take a picture together and said he’d be reading it on the plane home to Scotland! (Jo got a little excited about this, as you can see in the pic!) Thank you, Mr. McCall Smith, for such generosity of spirit!